Smith used the characters in Mallrats as well, and went on to write them into subsequent movies like Chasing Amy, Dogma, and of course Clerks II and Jay and Silent Bob Strike Back, their presence unifying all these stories into one coherent reality. Cinephiles argue over whether Smith has delivered on his promise as a director, but some fans think the man has found his true voice as a podcaster. Today, on his own podcast network, he hosts a staggering array of shows, including SModcast, SMoviemakers, Hollywood Babble-On, and Fat Man on Batman. 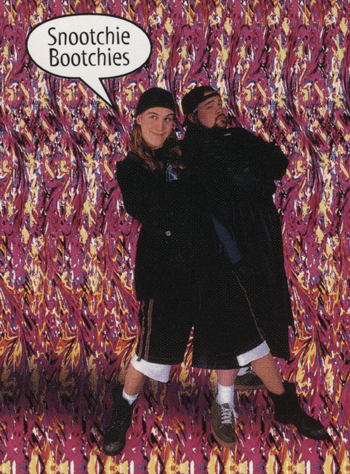 Jay and Silent Bob Get Old (Web - iTunes - RSS feed) reunites the 42-year-old Smith and the 38-year-old Mewes for regular conversations about adulthood, fame, and struggles with sobriety (in Mewes' case) and weight (in Smith's), always featuring the most vulgar jokes imaginable. If you haven't caught up with these guys since the nineties, have a listen to their podcast's so-very-Not-Safe-for-Work first episode above. They've even got back into character for Jay and Silent Bob's Super Groovy Cartoon Movie, which begins its roadshow across North America on April 20.